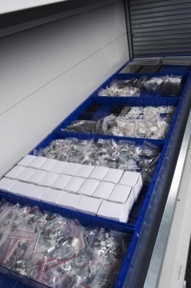 Firms introduce configurable storage boxes for Kardex Remstar's vertical lift module. Swiss material handling equipment company Kardex Remstar LLC said today it has acquired a stake in a Swedish provider of modular plastic containers, saying the move would help it provide greater flexibility and increased storage capacity to its customers. Zurich-based Kardex Remstar, with U.S. offices in Westbrook, Maine, did not disclose the price or the size of the stake it had purchased in Sumobox AB. However, Sumobox' website now calls the firm an "affiliate of Kardex Group." Kardex Remstar did not respond to a request for further information. As a result of the investment, Kardex Remstar announced it has launched a line of storage containers designed for the firm's Shuttle Vertical Lift Module (VLM), a high-density, goods-to-person material handling solution designed for parts storage and order picking.The new VLM Box features a modular design that provides flexibility in storage height, width, and depth, the company said. By offering more options for storing and organizing goods, the boxes can help customers improve stock accuracy and reduce the risk of picking errors, according to Kardex Remstar. The VLM Box will be distributed exclusively by Kardex Remstar. Feedback: What did you think of this article? We'd like to hear from you. DC VELOCITY is committed to accuracy and clarity in the delivery of important and useful logistics and supply chain news and information. If you find anything in DC VELOCITY you feel is inaccurate or warrants further explanation, please ?Subject=Feedback - : Kardex Remstar acquires stake in plastic container vendor Sumobox">contact Chief Editor David Maloney. All comments are eligible for publication in the letters section of DC VELOCITY magazine. Please include you name and the name of the company or organization your work for.